See it at Massachusetts General Hospital. By Chris Sweeney·	 12/4/2016, 6:21 a.m. 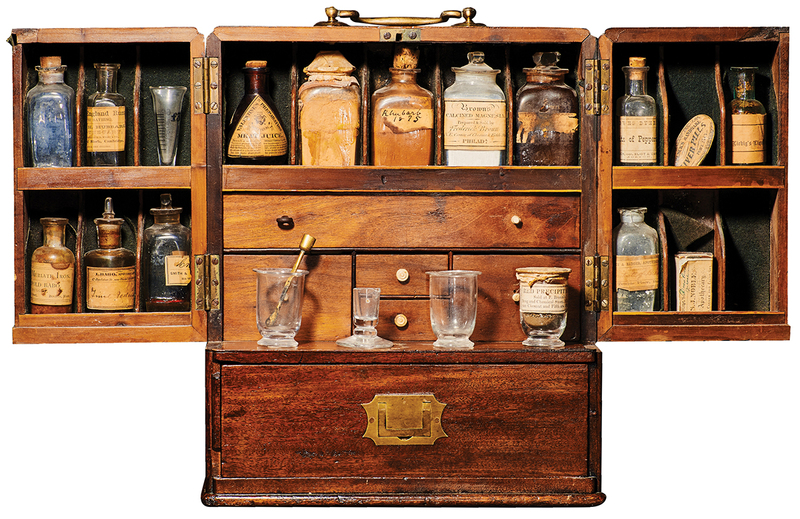 Most physicians today would cringe at the notion of prescribing meat extracts or concocting their own remedies from scratch, but medicine was an imperfect science in Victorian-era Boston, as evidenced by this 19th-century apothecary kit. The wooden case, which likely belonged to Massachusetts General Hospital surgeon Samuel Cabot, holds a number of noteworthy items, including powdered calcined magnesia, a precursor to the laxative milk of magnesia; essence of peppermint, a popular remedy in those days for indigestion; and a mortar and pestle, so Cabot could mash together these raw materials as he deemed fit.